We introduced you to Ratio Christi in the last part of this special series. We looked at its purpose and history in reaching high school and college students and faculty members with evidence for the truth of the Christian worldview. Ratio Christi started on one campus in the United States in 2008 and now has about 170 chapters across the country plus scores of chapters in many other countries of the world. Serving the needs of all those chapters is a challenge and Ratio Christi has developed a unique way of meeting the challenge. In the first part of this series about Hope For America’s Youth we presented the conflict – millions of young people are leaving churches during or after high school. In the second part of this series we shared the resolution – giving answers to questions about the hope we have as Christians through reasoning and persuasion. There are many ministries doing wonderful work in this area of providing answers and reason to young people in high school and college. In this part of our series we will share about one of the best Christian organizations currently doing this vital work. Christians often focus more on what they “get” than what they “give.” We get a lot from God. We are “saved” by grace through faith. That is not from ourselves. God gives it to us. We don’t work for it. We don’t deserve it. God gives it and we receive it.. Nobody can boast about being saved. God’s does it all and gets all the credit for doing it all. We are saved because of what Jesus Christ did on the Cross not because of anything we did, do or will do. Salvation is not based on our works. It’s all based on God’s grace. So how does that work? Let’s look at “work-walking” in the New Year – keeping this important point in mind. Work-walking has nothing to do with being saved. Salvation is by grace through faith. Work-walking is about serving God after salvation. 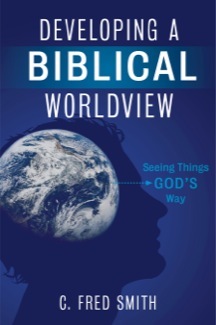 “Developing A Biblical Worldview: Seeing Things God’s Way” by Dr. C. Fred Smith (B&H Publishing, 2015) is an excellent book for any Christian interested in making disciples and defending Christianity. Everyone has a “view of the world” that affects their perspective on life and guides the choices they make every day. Christians also have a worldview and it’s based on the Bible, God’s revelation of Himself.